Enforcement officers in the North East are wearing body worn cameras in the first trial of its kind within the organisation. 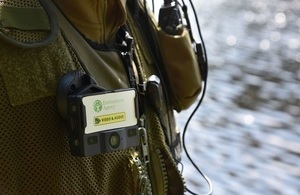 Environment Agency enforcement officers in the North East are wearing body worn cameras as part of a six-month trial. It is the first of its kind within the organisation and is aimed at assessing if cameras can help reduce incidents of anti-social behaviour, assaults and threats against staff, particularly those working with regulated and illegal waste sites. If successful, body worn cameras, which are now the norm among many enforcement agencies, could be rolled out to Environment Agency teams across the country. They could be used in a variety of ways, including at visits to poor performing sites, illegal waste sites, during fisheries and navigation patrols and even during incident response. Since the trial started in April, waste enforcement and fisheries officers have been wearing the devices during their routine activities and activate them if they encounter a hostile situation or site. I worked with body cameras in the police and saw how effective they can be so suggested we run a trial. Already officers have reported that wearing the cameras has prevented threatening situations from escalating. Environment Agency waste enforcement officers regularly encounter aggressive behaviour across the country. Since 2001, the Environment Agency has successfully prosecuted 59 cases of obstruction, hostility or threatening behaviour towards staff, 22 of which were in the North East. The safety of our staff is paramount. They are well trained in dealing with hostile situations and we take any threat against them very seriously. But our preference is to prevent hostility in the first place. Studies also show that people are less likely to contest the evidence when they know their offence is captured on camera. This could help speed up justice and reduce legal costs. Officers taking part in the pilot must follow guidelines on use of these cameras. They will not be permanently switched on and people will be informed if they are being filmed. If they are used the footage is automatically deleted after a month unless it is required for evidential purposes. Officers will only switch the cameras on if and when they enter a hostile situation. That could be a site where they have experienced aggressive behaviour in the past, or an unknown quantity where hostility may be anticipated, such as on a remote river bank.